signed and on verso titled on the gallery label and inscribed "Bonsecours Market" and "2468"
John Johnstone studied at the Art Association of Montreal under Impressionist William Brymner and later trained in Paris at the Académie de la Grande Chaumière. Back in Montreal, he became a member of the city's Pen and Pencil Club, and was included in the Beaver Hall Group's first exhibition in 1921. He painted Montreal street scenes as well as rural villages along the St. Lawrence. A.K. Prakash describes Johnstone's mature style as "essentially a beautiful, simplified realism, though influenced by Impressionism." There is an intriguing stillness in Johnstone's work, as seen in Indian Trinket Sellers, embodied in the solidity and stoicism of the First Nations women, patiently waiting for buyers. Broad brush-strokes bring strength and simplicity to the image, and the close vantage point and abstracted background make the figures dominant. 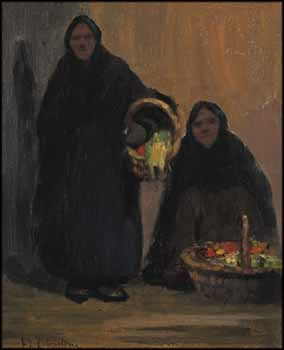 Johnstone's palette is primarily dark and earthy, giving strong contrast to the bright sparks of colour of the trinkets. One can sense Johnstone's empathy for the women, and this, together with his distillation of the image into strong, simple elements, gives this work its impact.